Posted by: Mambaon 2011/4/12 11:20:00 8809 reads We've talked in the past about releasing updated “XOOPS Module Packs” for our users, focusing on some basic functionalities of the Website, e.g. Personal Website Pack, Community Website Pack, etc. We are now working on a “XOOPS Basic Module Packs” and our goal is to modify existing modules so all of them have the same consistent GUI and thus increase the user productivity, especially for the first-time users. In order to make it easier for other developers to convert their module to this new GUI utilizing Mage's ModuleAdmin class, I've created a set of files helping with this conversion, and a short tutorial showing how to convert xDirectory (you can download the converted module here). a) This is just a 1st Draft of the Tutorial, so your feedback and improvement suggestions are appreciated. Please help us to make it simple and easy to read and follow. 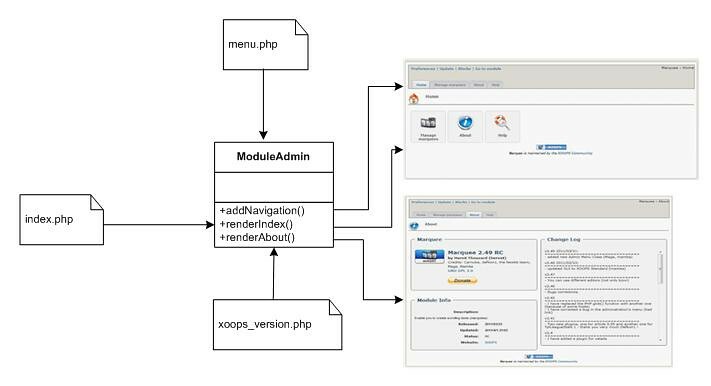 - beginners and first-time XOOPS users: how can we make the GUI simpler and more user friendly for you? - experienced module developers: how can we make it better? Is this ModuleAdmin class making module development easier for you? Please discuss the GUI and the Tutorial in this thread. I would suggest to wait a little bit with any updates of TDMCreate, till we get more feedback from people on the GUI. Once we finalize the GUI "look and feel", then we can update TDMCreate to be consistent with the GUI. So if I create the images in uploads/module, I know where the images will be included. Well thanks for having that defined.. Good Good.. I will have to look into it..
Btw tim for creating directories you will find this routine will actually work better, the code you have written is not compatible with win32 or win64 systems that don't create module_dir/images in one pass..
As i see is a good start, but i could recomend opening a forum related to this where we can go adding required options as we see that is needed to go porting our modules to xoops tdm structured modules. Also i hope that v3 is going to be fully compatible with what is decided on this.